Dig into the rich and varied flavors that make New Orleans one of the USA’s top foodie destinations. From the most famous local haunts to some delectable hidden gems, you’ll leave with not only a full stomach and a smile, but a greater understanding of how New Orleans food, culture and history all go hand-in-hand. Your culinary tour of New Orleans starts where it all began — the banks of the Mississippi River. From here, you’ll witness the lifeblood of this region which brought new cultures, new influences and new ingredients to the USA through its ports. As they say, breakfast is the most important meal of the day. To wake up your taste buds, we’ll indulge in New Orleans’ most iconic breakfast pastry, the beignet. While it looks hard to pronounce, it’s definitely not hard to love. Just make sure you watch the direction of the wind or else you might find yourself covered in powdered, sugary goodness! Next we will head to The French Market, the site of America’s oldest public market. Historically a place of diversity with products and people from all walks of life, today The French Market is a modern yet unique culinary space. We’ll be sure to stop for a local bite and get to know some of the colorful personalities who call this city home. From the French Market, you’ll embark on the picturesque streets of the French Quarter where your guide will take you to some of their favorite palate-pleasing spots. You’ll sample both a classic New Orleans dish, as well as a delicacy that you’ve probably never seen outside Cajun country. With an abundance of seafood, a fertile eco-system within the bayou and a history of spice trading, you’ll begin to realize why everything here tastes so good. Do you have an affinity for the spicier side? 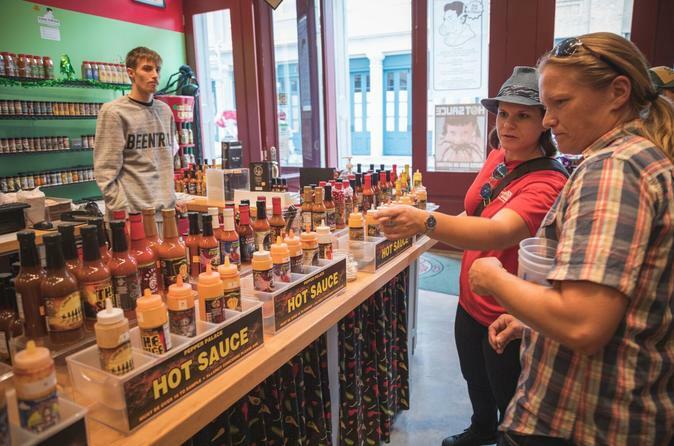 Then adopt the ‘when-in-Rome’ attitude and unleash some of Louisiana's hottest and tastiest sauces on your taste buds. This is the birthplace of Tabasco, after all. On this tour, you’ll have the chance to try a dish that sparks more controversy amongst chefs than any other in New Orleans: gumbo. Learn how hundreds of years of history has shaped this recipe and how it can vary from restaurant to restaurant. Finally, we will finish off with a sweet treat made from locally grown sugarcane and the region’s abundant pecans. No room for more? Don’t worry, they don’t call it the Big Easy for nothing. You can take your praline to-go and indulge when your sweet tooth kicks in. Before you go, don’t forget to ask your local guide for more tips on where to eat and what else to do during your stay in New Orleans.